Energy analyst Chris Nelder returns to Abu Dhabi for the World Future Energy Summit, and finds a country making slow progress toward its sustainable ambitions. Two weeks ago, I returned to the World Future Energy Summit in Abu Dhabi, United Arab Emirates (UAE). Arguably the world’s preeminent international energy and sustainability conference, with more than 30,000 attendees from 155 countries last year, the gathering offers a unique opportunity to hear the perspectives of political, business and scientific leaders seeking real solutions to the world’s most pressing problems. Unfortunately, my main impression of the experience is how painfully slow and difficult real progress is. I was particularly interested to see what progress had been made since last year’s conference, when I reported on Masdar’s ambition to transition to renewable power, a vision that is playing out in the organization’s proving ground for renewable energy and energy-efficiency technologies, Masdar City; and Abu Dhabi’s enormous water and food supply challenges. But I didn’t find much. Two new buildings that were under construction in Masdar City last year are now open: a green technology incubator building with a visually interesting exterior, and the flagship building that will serve as the Middle East headquarters for the German engineering company Siemens. Other than the completion of those two buildings, however, not much seems to have changed in Masdar City. With a small cluster of buildings occupying only about one-tenth of the original city plan some seven years after inception (including a few hundred students living or studying on site at the Masdar Institute) it’s still a long way from achieving the goal of having 90,000 people bustling around “one of the most sustainable cities in the world.” The new headquarters for the International Renewable Energy Agency (IRENA), also hosted by Abu Dhabi, is the only new building now under construction. A “market-driven residential neighborhood” is slated to be built in Masdar City over the next three years, but the UAE’s housing boom over the past 18 months has been centered not in Abu Dhabi, but in glittering Dubai, which expatriates view as a far more desirable location. The original vision of the city as a proving ground for sustainable technologies apparently has yet to bear any real fruit. I asked Masdar City officials for examples of technologies that were tested there which could be developed and marketed to the rest of the world, but the only one they cited was an in-house project to collect and model data from various sensors on the city’s buildings to prove building performance — a project that other sources told me is likely to be cancelled. The self-driving electric podcars that were originally planned to move people around the city are still functional and offer a fun short ride, but the fleet won’t be expanded beyond its existing pilot phase. Walking and biking are now planned as the main form of transportation around the city. Travel to and from the city, like transportation all over Abu Dhabi and across most of the UAE (except for a light rail system that covers some parts of Dubai) is still done over roads. The future of Masdar City now appears to depend heavily on whether it can attract equity developer partners willing to pony up real commitments — not just lend their names — to help expand it. Masdar City representatives repeatedly emphasized they are open for business, and that there are no taxes in the UAE. Masdar Clean Energy, the development arm of Masdar responsible for large-scale renewable power generation and carbon abatement projects, appears to have turned its attention outside the country. The 100 megawatt (MW) Shams I concentrating solar power (CSP) project situated about 100 miles from Masdar City is completed and operational, and a 10 MW PV system powers Masdar City, but no other domestic renewable energy projects appear to be in the works. Instead, the business unit highlighted the large projects it finished some years ago, such as its CSP plants in Spain and the London Array offshore wind farm in the United Kingdom. The new projects under development are all much smaller and in foreign countries, including a 6 MW wind farm in the Seychelles, a 0.5 MW solar photovoltaic (PV) project in Tonga, some small off-grid solar PV systems in Afghanistan, and a 15 MW solar PV project in Mauritania. A separate Special Projects team provides consulting services for a set of renewable energy projects too small for the Masdar Clean Energy unit, such as an off-grid system for an island retreat, with roughly a combined 100 kilowatts (kW) of projects in the pipeline. In fact, all of the headline announcements at the conference seemed to be for foreign projects. IRENA’s Abu Dhabi Fund for Development is investing $350 million over seven cycles in various renewable energy projects in developing countries, where there is a dearth of financing options. The fund will take up to 50 percent equity stakes in the projects to give developers leverage to attract the remaining financing from other international financial institutions. Funding in the current cycle totaled $41 million for 35 MW of projects, including a 3 MW hydroelectric plant in Ecuador, a 3 MW biomass gasification and biodiesel plant in Samoa, a combined 4 MW of solar PV with diesel backup in rural areas of Mali, and a 6 MW solar PV system in Sierra Leone. At a press conference, the presidents of Senegal, Ethiopia and Sierra Leone wanted the world to know that Africa is open for business to project developers, touting the country’s mineral and renewable energy resources, its “green growth” strategy and arable land (one-third of the world total). Another press conference featured a signing ceremony of a memorandum of understanding between H.E. Dr. Sultan Ahmed Al Jaber, CEO of Mubadala Energy and the Chairman of Masdar, and Crown Prince Frederik of Denmark, for a joint investment program in unspecified global renewable energy projects. The Danish ambassador noted that 57 percent of all electricity in Denmark was produced from wind in December, while the crown prince said his country is on track to produce 30 percent of its energy from renewables by 2020 and 100 percent by 2050. A third press conference detailed the “Wind for Prosperity” project initiated by Danish wind developer Vestas. Older, smaller wind turbines in Europe will be dismantled and reinstalled in some of the world’s poorest countries as a solution to energy poverty, while the former turbine sites are repowered with larger, newer turbines. By reducing the need to run diesel-powered generators, the presenters said the scheme will deliver a 15 percent internal rate of return under 20-year power purchase agreements. The only specific project mentioned, however, was for a pilot project in Kenya that will require some degree of government subsidy. I don’t want to be unduly skeptical about these ambitions. Lord knows the world’s poorest countries need all the help they can get to come out of the dark using renewable power, rather than turning to fossil fuels. No one is better positioned to offer that help than the oil-rich nations of the Middle East, with their abundance of excess capital. I’m absolutely, completely in favor of such partnerships. I unreservedly applaud the UAE’s leadership in fostering the development of sustainable technologies, and extending its hand to the world as an partner in sustainable development. They don’t have to do that; they could just blow their riches on more self-satisfying gold-encrusted trifles and amusements. With one more year now behind us, I saw no evidence of new domestic projects to improve efficiency or create more renewable energy capacity. The UAE’s per-capita energy consumption is among the highest in the world, and its carbon footprint is climbing fast. The country still runs almost exclusively on petroleum-powered vehicles and roads, and the use of both is expanding rapidly — particularly gas guzzlers like big, heavy SUVs and flashy, high-powered sports cars. Gasoline, diesel, and electricity are heavily subsidized, providing no impetus to use less. Removing those subsidies would seriously imperil the country’s economic growth, which largely depends on energy-hungry industries such as petrochemicals and aluminum. There are no major rail projects under way between the major cities in the UAE, such as Dubai and Abu Dhabi, although there are a number of light rail projects under way within those cities. The 90-mile drive between the two cities on Sheikh Zayed Road at rush hour, with seven congested lanes in each direction, was the most terrifying drive of my life. Drivers seem to regard it as a competitive event, tailgating each other at 70 mph and changing lanes without warning. Traffic speeds vary erratically between top speed and a complete, sudden stop. Fatal accidents are common. And road construction continues apace; now asecond deck is being considered for part of the highway in Dubai. If there is a serious effort to reduce the country’s oil consumption or to avoid making the mistake the United States made when it locked in an infrastructure of roads and cars, I haven’t seen it. Energy is simply one part of the manifold challenges standing between the UAE and true sustainability. At a session on the energy-water nexus, Mohamed Dawoud, the Water Resources Advisor to the Executive Director of Environment Quality at the Environment Agency of Abu Dhabi, noted that 40 percent of the country’s energy consumption is used to produce water. (As I reported last year, all of the water in the emirate’s distribution system, the water used for human consumption, is produced by nine large desalination plants that consume around 1 billion cubic feet of natural gas, worth more than $12 million, every day.) Conversely, a vast amount of water is used to produce its oil and gas. Abu Dhabi’s per-capita water consumption is one of the highest in the world. When I inquired about progress on last year’s high-profile announcement that three pilot, solar-powered desalination projects will be built over the next three years in Abu Dhabi, with the objective of having a commercial-scale plant operating by 2020, I was told project selection is still under way. Sixty percent of the country’s food supply is imported, which is a very difficult situation to change when70 percent of your water is being used for agriculture, your groundwater tables are dropping like a stone and becoming saltier, and your only other option is more desalination. Meanwhile, the country’s population has nearly tripled since 2002, mostly due to immigrants (including a great many white-collar workers from Europe and the United States, and blue-collar workers from the Indian subcontinent) who have transformed the major cities’ skylines from flat expanses of desert into gleaming architectural fantasies of glazing in one short decade. Just 10 percent of the population are native Emiratis. More broadly, the goal of diversifying the UAE’s economy away from fossil fuels while developing a strong domestic talent base and renewable energy industry seems more a mirage than a reality at this point. The real action seems to be in nuclear power, with 5,600 MW of capacity under development. Contrast that with Saudi Arabia, which intends to build 52,000 MW of solar capacity by 2030 and has justsigned an agreement with SunEdison to do a feasibility study for a $6.4 billion solar PV manufacturing facility in the country that could churn out 3,000 MW of PV a year. I want to believe in Abu Dhabi’s sustainable ambitions. I really do. I want to have a great story to tell, some day, about how one of the most oil- and gas-rich nations in the world helped lead the way to an efficient and renewably powered future. But I heard much more talk about encouraging dialogue and building frameworks and strengthening strategic partnerships than I saw steel being put in the ground. I sincerely hope the leadership of the UAE and Masdar will light a fire under its domestic renewable energy ambitions soon, and prove my skepticism unfounded. 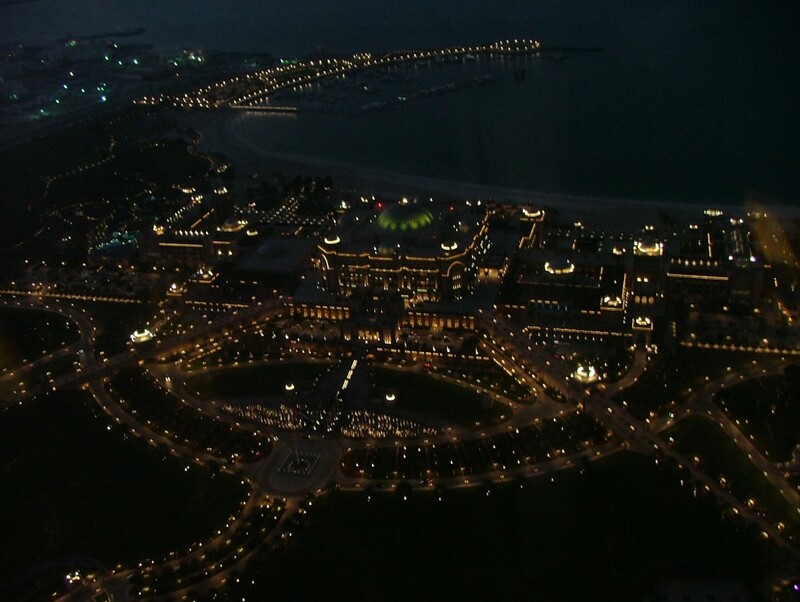 Photo by Chris Nelder: Emirates Palace in Abu Dhabi at night, from the top floor of the Jumeirah at Etihad Towers hotel.